Tubex Shelterguard shrub shelters are manufactured from recycled plastic mesh and a clear polyethylene film lining. 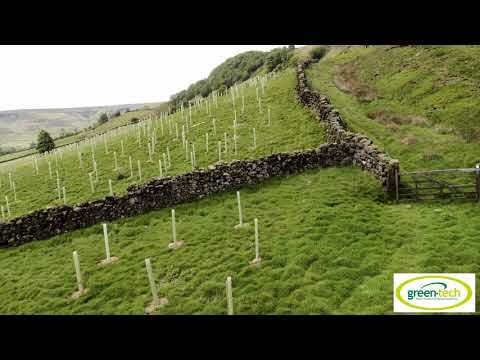 The film laminate which coats the Tubex Shelterguard shrub shelters, gives the trees, bushy tree and shrubs added shelter from the wind and herbicide spray, creates a sheltered micro-climate encouraging strong early growth and allows light to penetrate. The Tubex Shelterguard shrub shelters offer protection from browsing animals such as rabbits, hare and deer. Tubex Shelterguard shrub shelters have been designed to photodegrade in a two-stage process. The film laminate degrades first (after approximately 3 growing seasons), leaving a free draining netting shelter to continue to provide support and browsing protection. The Tubex Shelterguard shrub shelters have a moulded top lipping to prevent the abrasion of the tree stem. The plastic mesh and top lipping will photodegrade after 5-7years. Comes one height of 60cm only. Tubex Acorn Shelterguard shrub shelters are manufactured from recycled plastic mesh and a clear polyethylene film lining. The film laminate which coats the Tubex Shelterguard shrub shelters, gives the trees, bushy tree and shrubs added shelter from the wind and herbicide spray, creates a sheltered micro-climate encouraging strong early growth and allows light to penetrate. The Tubex Shelterguard shrub shelters offer protection from browsing animals such as rabbits, hare and deer. Tubex Acorn Shelterguard shrub shelters have been designed to photodegrade in a two-stage process. The film laminate degrades first (after approximately 3 growing seasons), leaving a free draining netting shelter to continue to provide support and browsing protection. The Tubex Shelterguard shrub shelters have a moulded top lipping to prevent the abrasion of the tree stem. The plastic mesh and top lipping will photodegrade after 5-7years. Comes one height of 60cm only. Unique combination of mesh and film provides browsing protection, a beneficial microclimate and enables use of herbicide sprays. Canes and Stakes sold separately.